This scholarship is sponsored by the New York State Lottery and is applicable only to tuition charges. 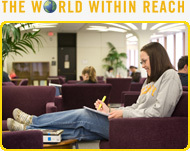 It provides for awards of $1,000 per year for four years of undergraduate study. Potential recipients are nominated by their high schools on the basis of academic performance, participation in extracurricular and community activities, and leadership skills. These scholarships provide up to $5,000 to New York State residents studying in fields leading to licensure in a profession approved by the Regents of the State of New York. Recipients must agree to practice their profession in New York State for at least one year. Preference is given to economically disadvantaged students belonging to a minority group underrepresented in the professions. This competitive federal honors program provides for scholarships of up to $1,500 per year to academically talented high school students who are New York residents. It is renewable for up to four years. Minimum eligibility criteria are a high school average of 95 and combined SAT scores of 1250 from the same test administration. This program provides renewable scholarship assistance in the amount of $500 or $1,500 to New York residents attending an institution within the State. Awards are based on student grades in specific Regents examinations. This award provides financial assistance to the children, spouses, and financial dependents of deceased or severely and permanently disabled victims of the September 11, 2001 terrorist attacks or the subsequent rescue and recovery operations. Undergraduates who are full-time matriculated students enrolled in an approved program in New York and meet requirements for New York State grants and scholarships are eligible. Recipients need not be New York State residents or U.S. citizens to receive the scholarship. Applications are available at www.hesc.com. The award covers up to four years of full time undergraduate study and will pay SUNY tuition and mandatory fees, actual room and board charged to students living on campus or an allowance for these items for commuter students, and allowances for books, supplies, and transportation. The scholarship is reduced by any federal, state or private assistance awarded to the student to pay educational expenses. This award provides financial assistance to the children and spouses of deceased police officers, firefighters, and volunteer firefighters who served in New York State and died of injuries sustained in the line of duty. Recipients must be full-time undergraduate students. Those attending SUNY institutions will receive scholarships that equal actual tuition and room and board costs plus an allowance for books, supplies and transportation. The scholarship is reduced by any federal Pell grant or other federal or state-funded scholarships or grants. Applications and more information are available from the New York State Higher Education Services Corporation.